Destiny is sharp as a knife? A Guardian’s arsenal bristles with guns. At any moment, three of them will step to the forefront of your inventory to put a variety of firepower at your fingertips. While keeping your distance from enemies of the City will always be wise, the mayhem of combat won’t always afford you that luxury. More desperate (or more strategic) moments will command a more personal touch. Melee weapons suggest a means of last resort. 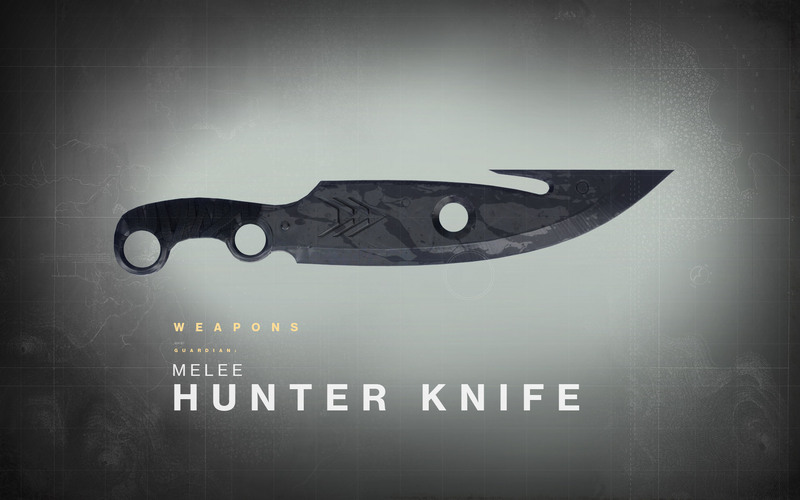 In the case of the Hunter, this blade also serves a tactical choice that favors stealth. “The hooded class of Guardian satisfies a survivalist fantasy,” promises Doyle. “We wanted to give the Hunter weapons that felt rugged, utilitarian, and quiet.” For the unseen hand, this weapon enables the silent kill. This fighting implement falls well outside a conversation about “cutting-edge weapons technology,” but the Hunter’s Knife has a way of driving its point home in its own way. We'll just leave this here. Power to you, girl.